Frans Bloem was born in Holland, but has been a resident of New York City for 33 years. He is famed for his excellent interpretation of chansonnier Charles Aznavour, who personally allows him to sing his songs. Frans has traveled to more than 50 countries, entertaining audiences with great success. His exceptional qualities as an entertainer not only make him "that singer with a beautiful voice" but also gives his performance an extra dimension that allows him to communicate in an intense way with his public. 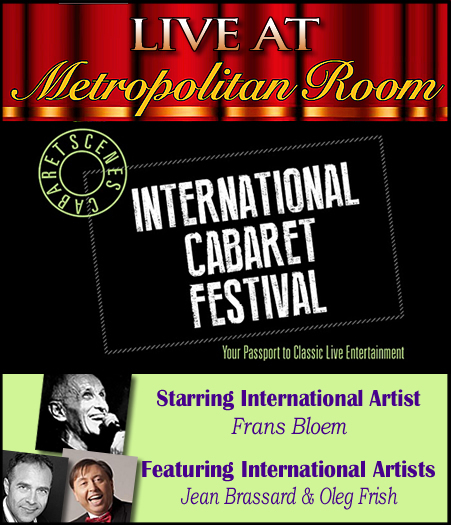 In 2002 Bloem received the New York Bistro Award for outstanding cabaret vocalist. Cabaret Scenes says of him, "With a passion that binds the audience to him, with spare movement and expressions, and with minimum narrative, Frans lets the songs communicate for themselves - and they do, with power and pleasure." Oleg Frish is a native of Russia and naturalized American citizen (2000) who has developed a distinguished career as a noted international celebrity television broadcast host, journalist, recording artist, performer and music historian. Oleg was born in Zaporozhye , the USSR into a family of musicians. His mother, Svetlana Frish, is a pianist and his father, Eugeny Frish, (2 sons, Oleg is the first one)was longtime head of the ( Seagull choir) and an important member of the artistic community. Oleg Frish. For Oleg growing up in the Soviet Union had its American culture challenges. American music was a Cold War persona-non-grata, but yet; hit classics like “Volare”, “Hello Dolly”, and “Sunny” permeated the Iron Curtain. Oleg’s love for music started with he was just four years old. By his early teens, Oleg had etched into his memory some 15,000 Russian, European and mostly contemporary American hits – artists and songs recorded in the golden decades of popular music from 1940 – 1980, and a range of genres, including American Songbook classics, swing, rock n’ roll, jazz, rhythm & blues, contemporary pop and disco. Having recently directed and performed in the homage to Edith Piaf Little Sparrow at the Duo Theater and about to represent Quebec at the first Manhattan International Cabaret Festival, Jean is a BISTRO and AGGIE awards recipient for his tribute show “The Kid From Paris – Jean Brassard Sings Yves Montand” for which he also garnered a MAC nomination. In New York he has performed at New York’s Laurie Beechman Theater, Metropolitan Room, The Triad, Helen’s Hideaway and The Café at the Pierre Hotel; he has been the guest of Steve Ross at the Metropolitan Museum on his “Dietz and Schwartz” and “Americans in Paris” programs. With the group Kabarett Kollektif, Jean was also awarded a NightLife Award. He was seen at Symphony Space’s Wall To Wall Cabaret alongside Uteh Lemper and many cabaret greats. Featured in the box-office hit The Fault In Our Stars and The Pill recently seen on PBS, Jean will be on the HBO "The Wizard of Lies" set this Fall when he will share the screen with Michelle Pfeiffer.